Strong oral hygiene habits, including regular dental visits, are a necessity when it comes to preserving good oral health. However, professional dental care goes well beyond simply cleaning the teeth. At Plymouth General Dentistry, Dr. Joan Kirschner offers a comprehensive range of general dentistry services to maintain a patient’s oral health while preventing serious dental complications. These services and treatments are advantageous to the teeth, gums, and the mouth as a whole. One service that can be especially beneficial to Dr. Kirschner’s patients is the fabrication of a custom mouth guard. Mouth guards are known primarily as a piece of athletic equipment, but these appliances not only protect the teeth from oral damage, but also address a number of other general dentistry concerns. Because of their numerous applications, we have treated many mouth guard candidates at our Plymouth, NH dental practice. Athletes: Mouth guards are required for a number of sports. Anyone who participates in contact sports, biking, rollerblading, or other athletic activity that increases the risk of an oral injury should consider getting fitted with a custom mouth guard. These devices absorb the shock of a fall or oral injury and protect the teeth and soft tissues of the mouth against traumatic injury. Those suffering from bruxism: Bruxism is the medical term used to describe habitual clenching and teeth grinding. This habit wears down the teeth and can lead to damage, decay, and infection. Because bruxism typically occurs at night, a custom mouth guard that is worn while a patient sleeps can protect the teeth from the damage caused by this harmful habit. TMJ disorder sufferers: TMJ disorder is a condition in which the joint that controls jaw movement is no longer functioning smoothly. This condition causes uncomfortable symptoms such as lock jaw, jaw popping, headaches, and facial pain. 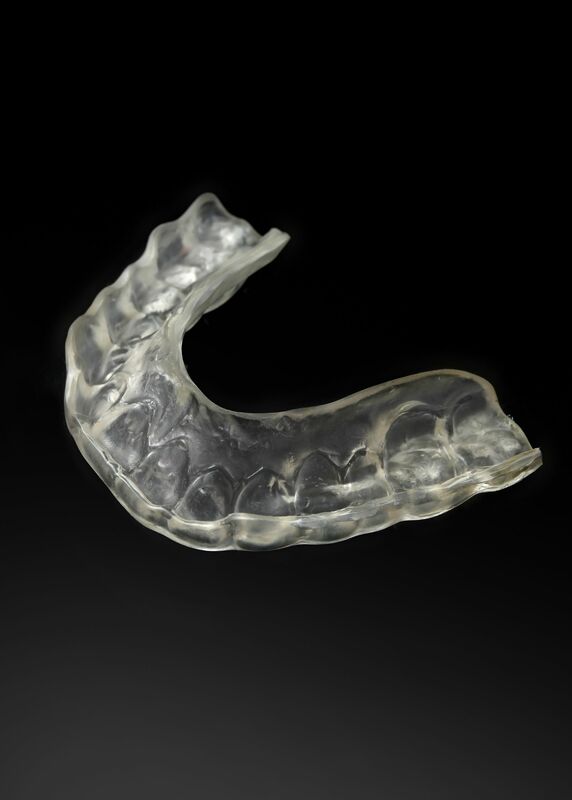 While there is no specific known cause of TMJ disorder, mouth guards hold the jaw in proper alignment while a patient sleeps; this has been shown to alleviate the symptoms of this disorder. Those with obstructive sleep apnea: Obstructive sleep apnea is a blockage in the airways that prevents patients from getting adequate oxygen while they sleep. As a result, these patients wake frequently throughout the night and never achieve the deepest level of sleep that is needed to feel fully rested. By aligning the jaw properly, custom mouth guards also open up a person’s airways so that oxygen can be taken in and a restful night’s sleep can be achieved. Contrary to popular belief, custom mouth guards are well-fitted and comfortable appliances that can benefit a number of patients, thanks to their multitude of uses. Whether or not you are an athlete, it is highly likely that you could benefit from a custom mouth guard. If you’d like to learn more about these oral appliances, and whether a mouth guard may be right for you, schedule an appointment with Dr. Joan Kirschner at your earliest convenience. We look forward to hearing from you.